You’re probably familiar with our general review of the best grow lights on the market. The difference here is power. Here we take a look at the best 1000w grow lights for those with a higher demand. While one of the more expensive 1000w LED grow lights in our review, this is also the best grow light we have found. 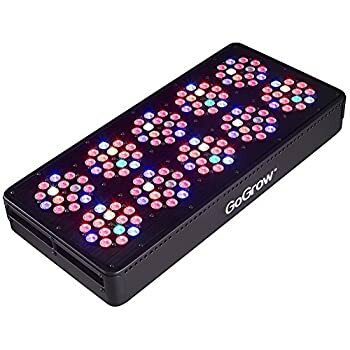 It has 336, 3W LEDs that come in six different wavelengths designed to give your grow exactly the types of light they need. One of the reason people are going over to LEDs instead of HID is that they are far more energy efficient and don’t waste so much power on heat. You will find that the Extreme 336X is cool enough that you can keep it just six inches or so above the plant without burning it or needing a cooling system. While rated at 1000W, this only consumes 500W of electricity so your daily electricity bill will plummet if you have been using HIDs. It also means that while the headline cost is far higher the savings made on electricity will eat into your total cost of ownership. 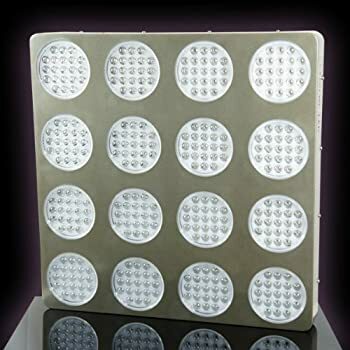 Unlike many of its rivals here, this 1000W LED grow light can cover 16 square feet of plants. Given that most mature plants only take up one square foot, that means you can constantly have plants at varying levels of maturity for a consistent supply of buds to suit your needs. We continue our round up of the top 1000w LED grow lights with a fine product by Illumintex. 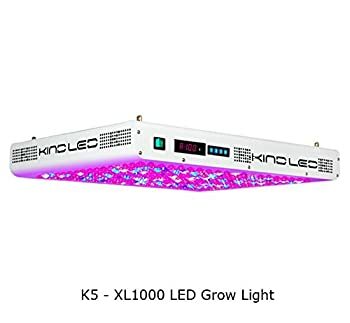 This 1000W LED grow light is very good indeed, with a major selling point being that it is IP66 rated so will survive a high humidity environment. Also of interest to someone reasonably new to growing their own is that Illumitex have a guarantee on the quality of the plants you grow: You will achieve a 15% yield increase against a 1000W HID equivalent, the plants will grow 15% more quickly, and there will be a 15% higher PPFD (photosynthetically active radiation) on your plants by comparison to an HID lighting system. If it doesn’t meet the ’15-15-15’ warranty you can have your money back. Those are BIG promises! Being an LED system it requires almost no maintenance during the lifespan of the equipment. The LEDs are rated at 60,000 hours, or pretty much all you will need for 12 years of growing. As with many of the others here, the lights are dimmable, meaning you can run full intensity during the ripening phase and a lower intensity as the plants grow. 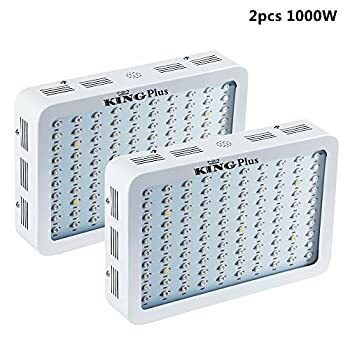 These 1000w LED grow lights are significantly less expensive than the Extreme 336X above but being at a lower price makes for a good value, no frills lighting system. It is rated at 1200 watts, and has a veg switch (for 524W lighting as the plant develops) and a flower switch for the last phase of the grow when the plants need a boost of light to help the buds grow and develop their sap. 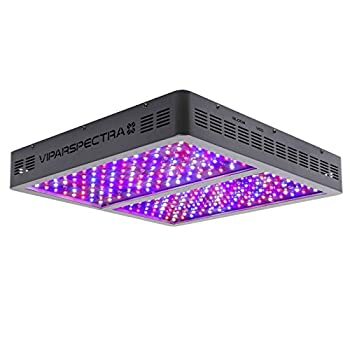 The Viparspectra 1200W grow light is rated for a 4×4 grow so you will be able to grow as many as 16 plants under the lights, allowing a consistent supply of fresh buds to suit your needs. This system comes with four fans to keep the ambient temperature down and while as loud as a desk fan, will keep the temperature down so you will not have to water the plants too much or take steps to regulate the tent temperature. This is the most expensive of the 1000w LED grow lights in our review yet isn’t at the top of the list. You don’t always get what you pay for. 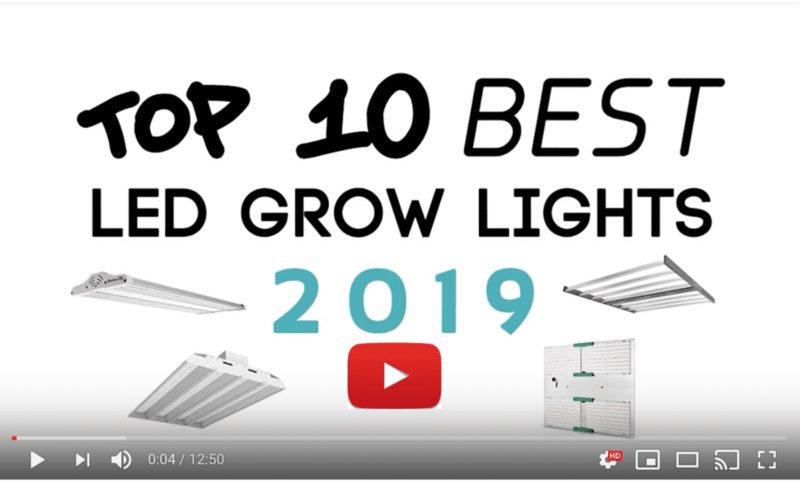 While the Kind brand is one of the best selling of all grow lights on the market, the marketing would have you believe that this is better than an equivalent 1000W HPS. 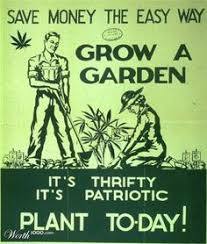 It isn’t, largely because it doesn’t have the canopy penetration of an HPS system. 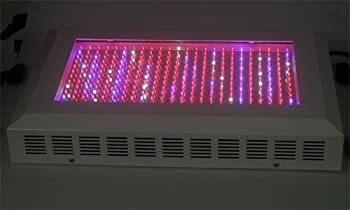 That said, people new to growing indoors should invest in a LED lighting system such as this as it is far cheaper to run overall and will save you lots of money in the long term. As you get to know the fully adjustable parameters of the light spectrums, so you will be able to get things just right, but do expect a few disappointing grows as you try different setups. Check out a full review of the KIND K5-XL1000 here. 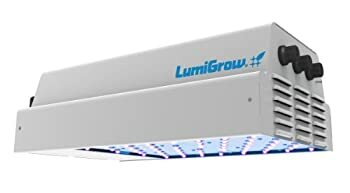 The LumiGrow Pro 650 is as the name suggests a good entry level pro 1000W LED grow light, so while each unit can comfortably do a 4×4 tent you could extend the package according to your needs should you wish to have more than 16 plants for example. One stand out feature of this package is that the light intensity can be varied as the plants develop, and you can adjust the PAR values manually using the knobs on the unit. This means you can experiment on a variety of parameters to get the light just right at each stage of development. Another cool feature is that the LumiGrow Pro 650 has a white light inspection switch so you can inspect the growth in human-natural light. Need we say that this is a lot more economical than an equivalent HID unit? There – we’ve said it! This pack of two, LED grow lights 1000w provides full spectrum lighting, suitable for all stages of the grow. They are relatively smaller than the others in this review so you need the two for a 4×4 grow tent. The King Plus lights run quite hot though this is mitigated with two extractor fans. Additionally they have holes in the LED board as well as a deliberately thicker glass to keep the heat inside the unit and upwards as opposed to potentially burning the foliage. Ultimately the results are in the quality of growth and these lights will not disappoint: you will see darker greens in the stem and leaves, and the bud sites are far more intense than you might find on a lower quality growing system. While one of the cheapest 1000w LED grow lights this doesn’t mean that it is a case of ‘buy cheap / get cheap’. 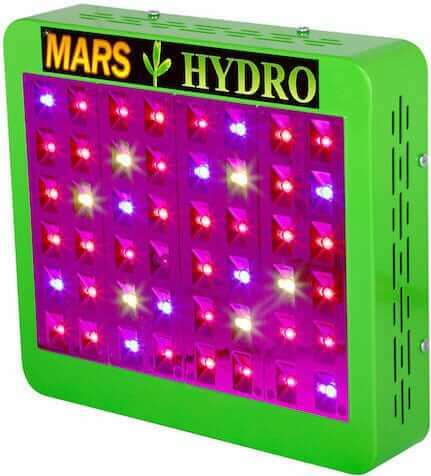 It is a very good entry level lighting system for someone new to growing their own, without shelling out up more than 5 times the cost as you can elsewhere in this review. While the other lights we review have customisable lighting adjustments, this doesn’t but instead the makers claim that there is more red in the spectrum that should help create denser buds on your flowers, ultimately packing a bigger punch when your taste the fruits of your harvest. While some of the more expensive lights here may last a decade or more, this lighting system only has a three year warranty. Check out a full review of the GOGROW V3 here. If this is what your wallet can just about stretch to, then consider the Pro Series full spectrum 300W LED quad band light for your home tent. Unlike many of the other 1000w LED grow lights here, the spectrum is fixed and can’t be tweaked according to the state of growth or the maturity of the plant. For a first timer with a small budget, do consider this as you will achieve some honest results. However in this world as with so many others you get what you pay for – don’t expect to have the best buds in your locality! We’ve also reviewed the Bestva X5 1000W COB panel elsewhere on this site. If you need a bigger light, have a look at our HyberGrow 1500W review, the Morsen MAX12 3600W or the PlatinumLED Platinum Series P1200. 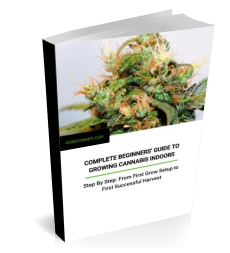 Also, check out the reviews on our sister site Big Buds Guide for a few more COB and 1000W options. Why wasn’t the Black dog PhytoMAX-2 1000 LED grow included in the review? Good point. We’re looking to cover Black Dog lights at some point soon. Also we regularly review and improve our existing posts, so we may well add the PhytoMax-2 here in the future.